I am very excited to hosting a giveaway with the lovely Lilla P. shop! I was lucky enough to be able to pick out some pieces to add to my spring wardrobe. Cotton is an essential for spring. Stripes are also such a staple for me so this cardigan was a no brainer. Lilla P. was excited to do a giveaway with eat.sleep.wear. to celebrate their store opening on 420 West 14th street in the Meatpacking District TODAY! Stop by and check out all their spring must haves or follow them on twitter to hear about their latest and greatest! 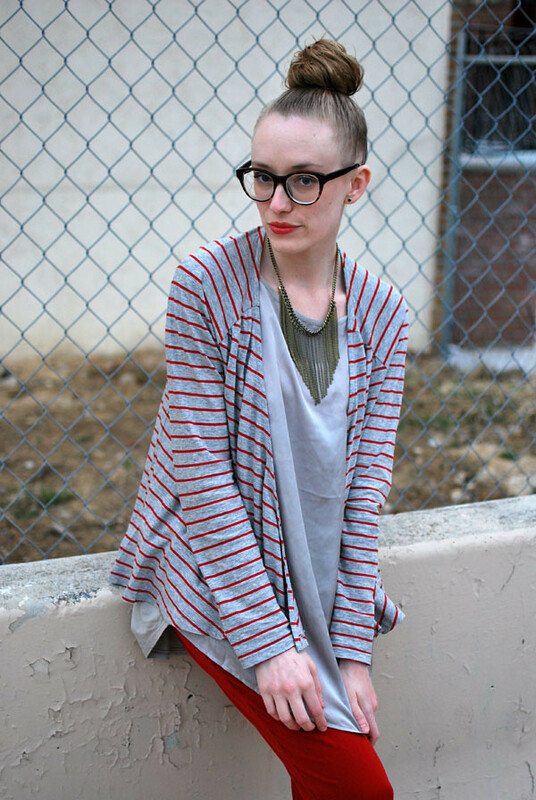 I will be giving away this stripe cardigan to one lucky reader! See below for contest rules and good luck my friends!! 1. Leave your name and email address in the comments to enter. 3. Contest will begin on Tuesday Mar 15th and end Monday Mar 21st at Midnight EST. Stay tuned for a full outfit post tomorrow. Nita-Karoliina - How cool. Count me in. Liz - woops! left my comment in the wrong spot of the giveaway, but I still love both styles!!! You look awesome! Shannon, Tropical Eats - Loveeee it. Samara - Thanks for doing such an awesome giveaway! Jaime Clark - I’m obsessed with strips. I love it! Nuha - yay! Love giveaways! michelle elaine - stripes for spring is a definite must! Cheryl - Love this giveaway! Christina - Stripes are the best and so essential for me! jamalyn - I love lilla P! Linley - What a lovely sweater! Grey and red look amazing together – and love the stripes! Sara - Love the red & grey. liza - ooh… i looove lilla p, and stripes! perfect!!!!!! Chelseabird - I would love a new stripe cardigan for spring! cuteredbow - Your necklace is beautiful and i love the red touch ! KateLainey - Adore Lilla P! bargain bex - if it’s stripes, i’m always in. Gina - Ooh, yes please! Lisa - hey there. count me in for the giveaway contest. thanks. rebecca - love it! great giveaway! Stephanie - That cardigan is fantastic! meg - love it – want one! Stacie from STL - I live in Lilla P. 🙂 Never been so obsessed with a collection the way I am with Spring 2011 Lilla P.
Asia Daly - Love the stripes! Autumn - Love the stripes in red and gray! Jeanna - Oh wow, this cardigan would be such a versatile piece! Great giveaway, Kim! Rin - I want in! Daniela Ramirez - I want it!! Courtney - I love stripes and this cardigan!